One image can change the way we see the world, especially in science. From photographs of movement that's too fast for the human eye to perceive, to atomic force microscope images of atomic bonds, pictures created by new technologies have often catalyzed scientific discovery. More than tools of discovery, though, images can help scientists communicate the reality of what they study to each other and the public. One poignant image can change not just the course of science, but also ordinary people's perception of their place in the cosmos. Here are ten powerful images that did just that - and one that's going to change our lives over the next century. Top image of the "Brainbow." Just as Da Vinci's anatomy drawings helped doctors visualize what they were working on, so too did Dmitri Mendeleev's efforts to organize what we knew of the elements into a rational data table. Mendeleev established the periodic table in the mid-nineteenth century, organizing the known elements and predicting more that have since been discovered. This table first appeared in a form that doesn't look much like a table - it comes from a manuscript draft. The Periodic Table, which all schoolchildren memorize today, is one of the earliest examples of an infographic helping people to understand a scientific discipline. In 1868, a dinosaur skeleton went on display for the first time. Fossil hunter William Parker Foulke had discovered the remains of a Hadrosaurus foulkii (named after him). Although five other dinosaurs were already known at the time, Foulke's skeleton was the most complete one ever discovered, and it was mounted and displayed at the Academy of Natural Sciences in Philadelphia (along with many other museums in America), bringing dinosaurs to the public awareness. Images of the skeleton circulated widely, impressing on the general public for the first time what naturalists had known for centuries: The world was once ruled by creatures far stranger than we could ever imagine. In 1878, Leland Stanford, then the former governor of California and a horse aficionado, commissioned photographer Eadweard Muybridge to prove his pet theory: that galloping horses actually lift all four hooves off the ground. Muybridge set up a series of cameras to take 12 shots in under half a second, creating an early filmstrip. This not only demonstrated the truth of Stanford's theory, but also became a precursor to the motion picture. At the time, photography was a relatively new technology, so these images are an example of a new imaging technology being applied to a very old question, and at last revealing an answer. Roentgen had already proved his capability as an experimental physicist, and the experimental set-up for the study of the "new light" was carefully planned. To document his observations he used photographic plates. On the evening of December 22, 1895, he asked his wife Bertha to let him photograph her hand using the new rays. After a fifteen minute exposure the first radiograph of a human being was obtained showing clearly the bones of the hand and the two rings she was wearing. X-rays played a part in one of the twentieth century's greatest discoveries. Scientist and x-ray crystallographer Rosalind Franklin, in this x-ray diffraction image (dubbed Photograph 51), demonstrated the double helix structure of DNA. The diffraction pattern you see not only suggested the likely double helix structure, but also that phosphate structures (what we now know as DNA bases) were on the outside. Her work inspired colleagues James Watson and Francis Crick, who later won the Nobel Prize for the discovery (Franklin had died by then, and Nobel Prizes are not awarded posthumously). The world's first neutrino observation in a hydrogen bubble chamber was found Nov. 13, 1970, on this historical photograph from the Zero Gradient Synchrotron's 12-foot bubble chamber. The invisible neutrino strikes a proton where three particle tracks originate (right). The neutrino turns into a mu-meson, the long center track. The short track is the proton. The third track is a pi-meson created by the collision. 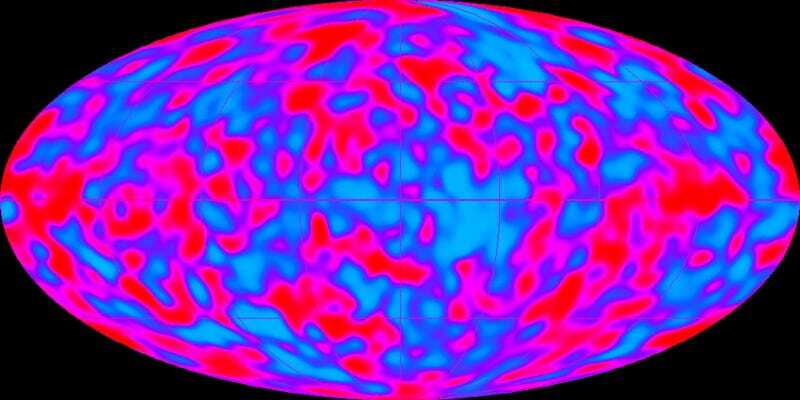 First Image of the Cosmic Microwave Background (evidence of the Big Bang), by George Smoot/NASA COBE (from observations taken 1990-92) The enormous heat of the Big Bang created waves that are still detectable, although they have cooled and stretched out to microwaves since, forming the cosmic microwave background radiation. The presence of this radiation, which provides supporting evidence for the Big Bang, was predicted back in 1948, accidentally observed in 1965, and originally seen as uniform in brightness. However, more sensitive instruments can detect tiny fluctuations (the variations are less than one in one thousand), and create a map of the temperature of the CMB over the sky. The first such map was created in 1992, based on data gathered by the Differential Microwave Radiometer (DMR), an instrument on the Cosmic Background Explorer (COBE) satellite, which NASA launched in 1989. Physicist George Smoot won a Nobel Prize for his work on the CMB. To trace the longer pathways that interconnect different brain regions, CBS labs developed a genetic method to label each individual nerve cell a different color to identify and track axons and dendrites over long distances. 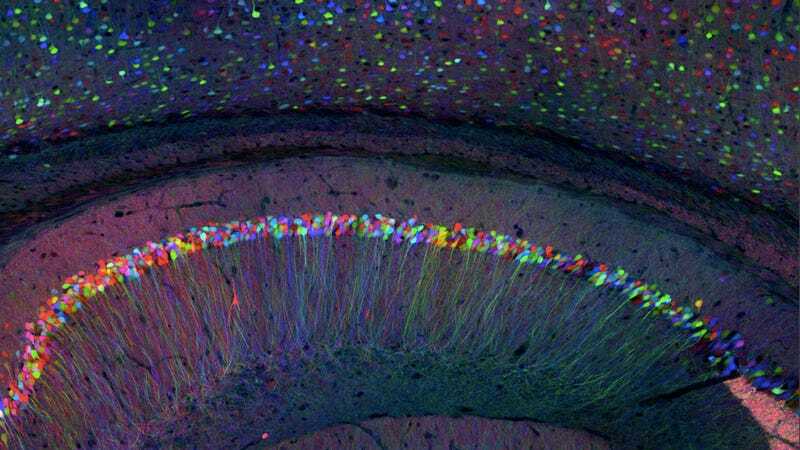 With light microscopy, scientists image the branching patterns and connections of all the axons within a region of the nervous system in transgenic mice that express a number of different fluorescent proteins in individual neurons. The idea here is to color-code the individual "wires" and "nodes." The images below give an indication of the power of this approach. While this image hasn't changed the course of science yet, it hints at a future where we will have greater and greater access to molecular structures - both as observers and engineers.